Some commenters have been pushing us to review Ghajini, presumably out of interest in seeing how we compare it to Rab Ne Bana Di Jodi, and - well - okay, here you are. We think most of the interesting discussions regarding it have already been had - read the contrasting views of Beth and Filmi Girl, for example - so we'll keep this brief. In many ways, Ghajini was the best Hindi film we saw in the cinemas this year - and it was a lot better than Ran Ne Bana Di Jodi. However, this was a pretty lackluster year for Hindi films and almost anything is better than Rab Ne - so does it count for much? Aamir in his "grrrr" mode. Ghajini is an old-school masala entertainer and, generally, it succeeds, skimming around its punchy, borrowed premise with a carefree, likable style. It's pure pulp that requires you to suspend your intellect for nearly three hours of gruesome dishoom dishoom, lovable courtship and fun songs. We should put a disclaimer here that we've seen very few Aamir Khan films and have never warmed up to him - his persona of the "thinking viewer's alternative" and his long-time spurning of awards ceremonies and the media has only made us regard him as someone who takes himself a little too seriously. That said, many of our (female) friends love him - mostly because he is, as someone once said of Sean Bean, the thinking girl's piece of crumpet. Meaning, he is very handsome and actively projects an "intellectually-friendly" image (don't ask us how Sean Bean earned this label, we don't know). 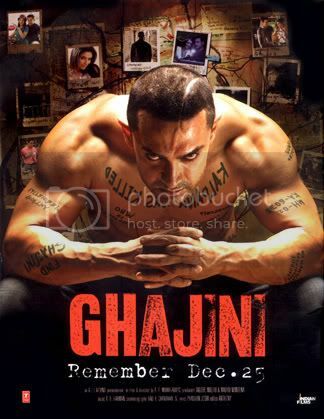 For a biased PPCC, we found Aamir thoroughly likable in Ghajini. He didn't have the same depth and humanism of, say, oh, we don't know, Anil Kapoor, for example, in his similar roles of pulpy revenge-seeker, but Aamir does have those pretty eyes and pretty pout and well-chiseled abs. The PPCC could not really complain. Ghajini, which is a twice removed remake of Memento, basically drops Memento's two most defining characteristics - the narrative structure and the villain's identity - in favor of something a lot more straightforward. The only salient plot point retained is the protagonist's short-term memory loss; every fifteen minutes, poor Sanjay Singhania's (Aamir Khan) brain reboots like a computer and he has to start from scratch. The film starts in this disorienting world, where Sanjay uses a single, motivating passion - the desire for revenge - to string together his life from reboot to reboot. With strategic tattoos ("Kalpana was killed" sprawled gruesomely over his chest) and Post-It notes, Sanjay wakes every day to the fresh rage and grief of learning, again and again, that his beloved Kalpana (Asin) was, indeed, killed and he needs to find the killer. The killer, we quickly learn, is Ghajini (Pradeep Rawat), a seemingly random goon who looms ever larger as Sanjay pieces the mystery back together. With some supporting characters, such as a snooping police officer (???) and Sunita (Jiah Khan), acting little more than Greek chorus, we follow the narrative's twists and dives into flashbacks of Sanjay and Kalpana's courtship. This change in tone, which could have been easily mishandled (and was considered mishandled by Beth), was fine for us. That is, Kalpana's characterization of the quirky, empowered, self-promoting con artist was so lovable that we just basked in the sunshiney glow of the Happy Time! flashbacks. Plus, the playful deception - where Kalpana invents the relationship and Sanjay invents an alter ego - was fun and funny, and everything was painted in that reassuring "everyone's gotta heart a gold!" vibe. The film, at this point, even had an unexpected reference to French hit Amelie - where Kalpana guides a blind man to the bus stop, excitedly describing the quotidian humanity of the street all the way, in much the same way Amelie did back in 2001. That should give you a good idea of Kalpana's character: she is the cute, quirky, decent-hearted girl next door. Sanjay (and the audience! and the PPCC!) completely falls for her, so it is genuinely traumatic when Kalpana is killed. Which segues into the main problem with Ghajini, which Beth and others have already noted: the second act is so violent! Sure, it's probably because the production values are higher nowadays and so the regular old masala dishoom dishoom can suddenly acquire a lot more realism, but we found ourselves squirming in a few of the scenes. In particular, the camera lingered on the gory details of Kalpana's death scene in ways that we thought were unnecessary and gruesome. Similarly, the final revenge against Ghajini was both philosophically disappointing (just another case of "eye for an eye" stuff, which morally undermines the whole good guy/bad guy dichotomy for us!) and, again, really gross. Filmi Girl and the PPCC discussed this violence post-viewing, and the issue of "over the top comedy violence" - as found in Oldboy or the Kill Bill series - came up. For example, in one scene, Sanjay punches a hoodlum so hard the latter's head literally spins around. Ugh! While we at the PPCC can usually handle blood-splattering violence if done for exaggerated black comedy effect (we tolerated it in Oldboy and Kill Bill, after all), we found it an unexpected new addition to modern masala. Something that took a little away from the precious, tender masala dil which so defines the genre. That said, dark, brooding, revenge-driven masala can be a lot of fun. This film shared some notable similarities with Duniya Meri Jeb Mein (injury causing disability, cute courtship juxtaposed against violent scenes of revenge) and Tezaab (torturous narrative full of flashbacks, a hero prone to meltdowns at maximum intensity, cute courtships juxtaposed against violent scenes of revenge). We prefer Duniya Meri Jeb Mein and Tezaab, though, if only because there the necessary violence was mostly implied. Part of this is production value, but part of it was also some gentleness towards the audience. For example, there is a scene in Tezaab when one character's face is splashed with corrosive acid. It is a horrific moment, and the other characters can only look on in horror as the victim clutches their face and screams in pain. We kept cringing in anticipation of when the camera would pull back, the character would lower their hands and we would see some (probably low-budget) horror mask of tendons and seared flesh. It was with a HUGE sigh of relief and some surprise that the moment never came - instead, the victim smashes a mirror and the scene cuts away. Ghajini, instead, lingered on the gore and detailed all the splashes and squirts - it was the type of film that would have showed us the face. Apart from the violence, though, the potentially problematic juxtapositions within the film's mood of light and dark were handled well. For example, the pre-head injury and post-head injury Sanjays are jarringly different, but we think there are several interesting threads of continuity in Sanjay's characterization: that is, his single-mindedness (about business in the past, about revenge in the present) and his craftiness. We thought many of the other contrasting parallels throughout the film - Sanjay and his alter ego "Sachin" (or was it "Sachit"? ), Sanjay and the policeman's relative detective skills, the awful scene of actual revenge - were quite interesting from a moral vacuum, purely aesthetic point of view. An unambiguously awesome aspect of the film was the music. Filmi Girl has already mentioned the divine Guzarish, and - in a year chock full of great A.R. Rahman soundtracks (Slumdog Millionaire! Yuvvraaj!) - this is another gem. The picturizations, especially during the happy courtship, were also both beautiful and fun. We'd say - as long as you're not too sensitive to violence, go and see it in the cinema. It's the best masala you're gonna get this year. Hi PPCC. Love you reviews usually but my main problem with the movie was that the romantic portion rang so hollow. Even if I like Sanjay Singhania and Kalpana (and honestly, I liked her a little less than you did) there was no warmth between them. They were nice people on the whole who were also nice to each other. But I found it very hard to believe they really loved the other. Keep the Anil Kapoor reviews coming though, may I recommend Shakti - a battle of wills between Amitabh Bacchan and Dilip Kumar with Anil Kapoor in a very young, very sweet 2 minute-cameo? Aamir = 8-pack, Sunny-clone, trying to be 16 but he is likeable so it usually is maaf. Expected more from him. Gauri - I think the reason I bought the romance was because I had very low expectations that it would work - I was expecting something a lot more schmaltzy and, I don't know, inappropriate-feeling. So when they went the "quirky humor" route, I loved it! Gasp, you ring my Dilip Kumar bell! I think I actually have Shakti, it came as a 2-in-1 on the Mashaal disc. The style of this movie is actually very Tamil masala... you know that scene in Rab Ne where Taani is giggling at the hero who's beating up several guys standing still in a circle after throwing the girl up in the air, only to catch her once he's knocked all the bad guys down? That's a modern day Tamil action movie and Taani is me and my cousin. PS - Jiah was the one character I WANTED to see dead and it never happened. Unfair! It's too sad for me,but I don't like Aamir khan...perhaps ghajini is an excellent film/masala,but Aamir gets on my nerves... .
Ps : I love your blog,it's a very interesting blog! I finally saw this one last night and liked it a lot. I don't have a problem with watching violence on film and I liked the fight scenes. Asin totally stole my heart, great rom com melo heroine. On a side note: I don't think this film is a remake of Memento (very good film with an unusual narrative structure good for single viewing) it used short term memory loss as a plot device but how it was handled is very very different. Thank you for the review, as always it is a very good read. this movie is my favorite film, and kalpana did well act in this film.